Warner's Blue Ribbon Books,who publishes the industry leading Swarovski catalog, announces 2010 books with the latest information on new Swarovski crystal product introductions together with accurate Swarovski values for retired Swarovski Crystal. Warner's Blue Ribbon Books continues yearly tradition of releasing publications, this year for 2010 updates. As in previous years, they are offering four books with the latest information on new Swarovski crystal product releases together with accurate Swarovski values for retired Swarovski Crystal. 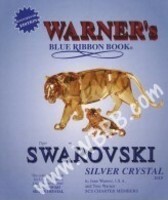 Warner’s Blue Ribbon Books on Swarovski has been publishing Swarovski Books on Crystal for 17 years. While other collectors have attempted to do similar annual publications on Swarovski, no one else in the world has succeeded in producing a quality publication with photos and Swarovski Value. Researching values and keeping the books up to date is a commitment that the authors take seriously as they are Swarovski collectors. They know how important these books are to keeping Swarovski collections organized and insured. In their books, the Warner’s use the term ERV, Estimated Replacement Value, to indicate the amount of insurance they recommend for insuring a particular Swarovski figurine. The detailed research they perform on a regular basis determines the value they ultimately assign to each piece. While some years prices are lower, other years the prices are higher. Factors that contribute to value fluctuations include economy, supply and demand, and the likeability of the individual pieces. The Silver Crystal Price Guide contains photos and detailed information about SCS products and Silver Crystal product releases (as well as product variations on those releases) for the past 34 years. That's over 1200 Swarovski Crystal items in the Silver Crystal Book. The silver crystal is organized by category in the book: SCS (Swarovski Crystal Society) releases, Disney, Animals, Paperweights, Candleholders, Fruit and Botanical, Silver Crystal City, Musical, Clocks, Boxes and Containers, Picture Frames, Chinese Zodiacs, Lovlots, Other Issues, Dealer Plaques, and Christmas Ornaments. The Beyond Silver Crystal Swarovski Price Guide contains information on over 1650 Swarovski Crystal and products. While some products were commissioned for exclusive use by their own company, such products were made by Swarovski using Swarovski Crystal. Many collectors are intrigued by these types of products as well, so as the items are discovered, they are continually added to this price guide each year. 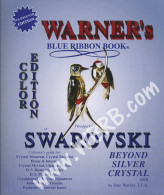 Warner's Blue Ribbon Book on Swarovski: Beyond Silver Crystal is the corresponding book for all the items that are not in Swarovski’s Silver Crystal product line. This Swarovski Book contains: Crystal Moments, Home & Interior, Daniel Swarovski Home Accessories, Daniel Swarovski Masterpiece, Julia's World, Perfumes, Paperweights, Trimlite, Crystal Signatures, Christmas Memories, Crystal Scents, CrystalograMs, Buddha, Arribas Creations, Crystal Paradise and more. Warner's Blue Ribbon Book on Swarovski: Beyond Silver Crystal continues to grow in demand largely due to Swarovski restructuring their product lines. For example, when Swarovski takes an item from the Silver Crystal product line and moves it to the Crystal Moments product line, it is moved from the Silver Crystal Book to the Beyond Silver Crystal Book. The authors realize that cost is a key factor when making any purchase. For this reason, they continue to offer both their Swarovski books in a color picture format as well as a black and white picture format. The content and Swarovski information in the books is the same. The pictures are the difference. Additionally, when customers purchase the set of books, there is a discount. Warner’s Blue Ribbon Books on Swarovski can be found by visiting their website http://www.wbrb.com which has been online for over 16 years. Swarovski collectors and readers return each year to stay on top of their Swarovski collection value and management. For the passionate collector looking for more than Swarovski Books, they can also provide recommendations to reputable brokers like Crystal Exchange America. Crystal Exchange America presently has over 5000 products in their online store, most of which is retired Swarovski. For collectors who prefer to receive data online, the authors recommend subscriptions to their online book, found on Warner’s Blue Ribbon Books Online.